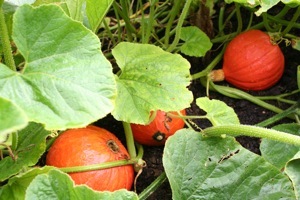 The first half of September has continued August’s growing theme with reasonable warmth and occasional moisture, although a total rainfall of just 5.0mm in the month’s first half means a little watering may be necessary of larger salads, celeriac, fennel and leeks if they are maturing strongly. Although lower temperatures mean less water is needed, plants’ larger size means their extensive root systems can use more and I have been impressed how dry the soil is under Zermatt leeks I am harvesting and lettuce stumps I am twisting out. 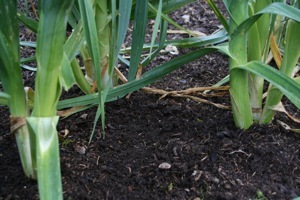 Leeks have grown to a good size from module sowings, planted in threes and fours at surface level, so stems are not white but nicely pale green and a good length. There is some damage from leek moth but much less than last year, presumably thanks to the lousy summer stopping them flying! (STOP PRESS 17th September I have suddenly found LOADS of leek moth maggots eating into these lovely leeks, no way of stopping them, such a shame). Zermatt leeks sown in modules in April, now ready. Recent fine weather has allowed the flights of many brassica butterflies and I have been doing regular squashing of caterpillars on cabbage, Brussels and kale. Usually plants will come through this period of damage, perhaps stronger for it, to make healthy new leaves in October when the caterpillars have mostly pupated. The damage to brassica salads such as land cress and rocket was earlier on – they looked awful from flea beetle damage until about August 20th, rather later than usual. 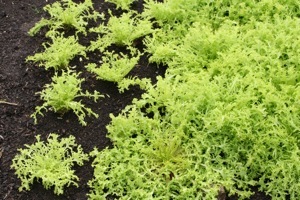 Since then, new growth is more vibrant, bright green and with no holes, and tastes absolutely wonderful, so I hope you sowed some and some oriental leaves too, for autumn salads. 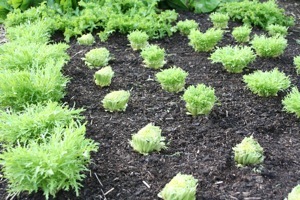 A tray filled with cow manure, or in soil, with best results are from using some cover. Now you can be sowing them all again for overwintering undercover, aim to finish sowing by the equinox so that plants have time to establish good roots before winter, which will power faster growth in any early spells of milder weather next winter and spring. The only salads I sow after the equinox are mizuna and leaf radish, especially mizuna which otherwise risks ‘maturing’ if autumn is warmer than usual, as it was last year when I had to pick some tunnel salad leaves for compost, as they were growing faster than I could sell them; but that was unusual and it is best to assume normal temperatures. 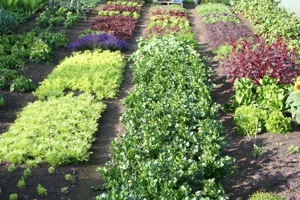 Module plants soon ready of spring cabbage, mizuna, spring onion. 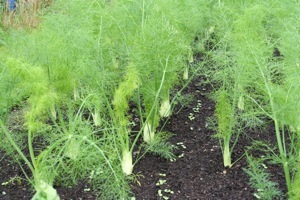 Fennel undersown with lambs lettuce. Outdoor plantings of spring onion and cabbage want to be in the ground by month’s end, then you can plant garlic too, but I suggest waiting until November for sowings of broad beans, so they are only small before winter and more frost hardy than taller plants. For onion and cabbage I spread compost before planting, for garlic and beans I spread it after sowing; either way, this is time for feeding soil, from now until year end as soon as you take a last harvest and soil is bare, so weed thoroughly as well, before composting. No need for a mulch cover on top unless you have lots of couch grass and difficult perennial weeds. 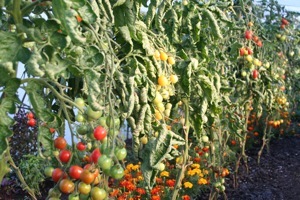 Tomatoes have been ripening well undercover and should continue into early October, as long as blight is absent. Water much less now, to speed ripening, and keep all leaves above remaining fruit; otherwise there is no way for plants to pull in the sun’s energy and transmit lovely flavours, texture and colour to remaining fruit. There is also a tradition for removing outer leaves of celeriac, but don’t take this too far, just the yellowing ones at the bottom, and weed at the same time. In 2009, Robin and I did a trial of removing about half the leaves in mid September on a few roots, which then looked lovely as their swelling bulbs were clearly visible – but they grew less after that than their neighbouring roots which had more leaves on. Winter brassicas are another case for removing yellowing leaves at their base, again a good opportunity to weed and take out a few slugs too. Plants of kale, Brussels and sprouting look lovely after a little such cleaning. A mid September view of the bottom garden with celeriac in the middle. Squash and leeks with lambs lettuce emerging. Summer is ending, fine weather can return! I was swapping notes with a local farmer who has forty years experience and he said that this has been the most difficult year of all, with so little sun and warmth right the way through from April to August, here in Somerset at least. I know that some parts of south east and north west Britain have had slightly better weather but altogether it has been a year to reveal all the potential difficulties of growing food. Look on it as an opportunity to see where your plot can be improved, for instance by cutting back any over-growing edges to reduce slug habitat, and by being more diligent and organised about weeding. Chase up the allotment secretary if a neighbour’s overgrown patch is hosting slugs which invade yours. Mainly Rosada F1, helped to ripen by watering less, leaves left on above fruit! 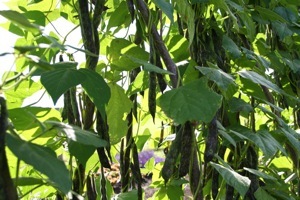 Growth of beans for drying, runners Czar. Borlotti is now abundant but late… will they make it? Endives harvested by cutting, Frenzy on left & Bianca Riccia on right. Regrowth is FAST, 2 weeks difference in Bianca. 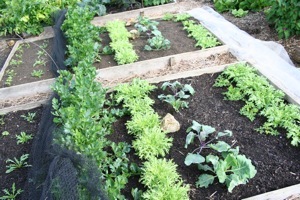 Keeping on top of weeds now, even under mature vegetables, is not a question of helping established vegetables growing now, but of thinking ahead and having an easier ride in the autumn and later. 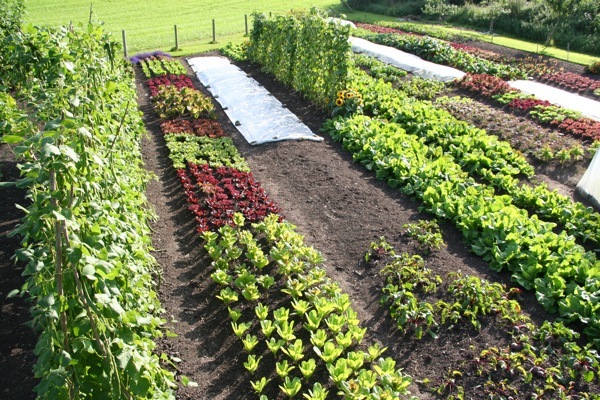 Having no weeds means that no weeds can go to seed, saving work in the future, and also it means that when you clear vegetables as they finish over the next three months, you have the simple job of spreading compost and/or manure on clean soil, between one and two inches deep. That is all the preparation needed for winter, far quicker than digging. 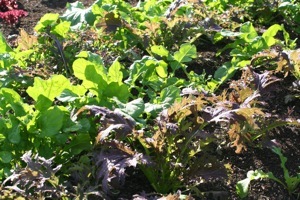 But if starting with a thoroughly weedy soil, and if you have lots of perennial weeds such as couch grass, ground elder, buttercup or whatever, I suggest that after spreading some compost and manure, you cover the soil with a light excluding mulch – black plastic, or cardboard which will need a second layer in winter. This mulch can stay on until next spring, and because of slugs and lateness of starting I suggest growing courgettes and summer beans rather than attempting early sowings of carrots and spinach. Any unrotted organic matter and light excluding mulch (green manures too) give shelter to slugs, as opposed to the normal, no dig use of a thin layer of compost which slugs are not too keen on! 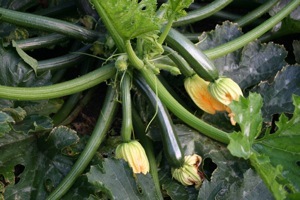 Courgette Early Gem F1, planted May 16th under fleece. 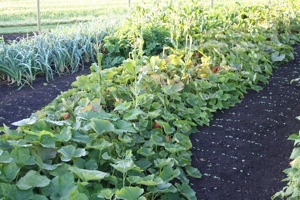 Uchiki Kuri squash planted May 25th under fleece. In my gardens it has been a year of steady growth, especially of leaf and root vegetables, also broad beans and peas which are happy in low temperatures. 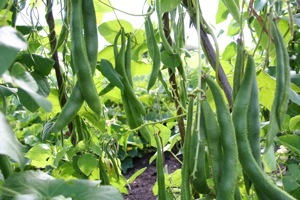 Summer-fruiting vegetables are the only ones to grow less than average, especially French beans which adore heat, and I am worried that my beans for drying may not manage to dry, unless September is really fine! 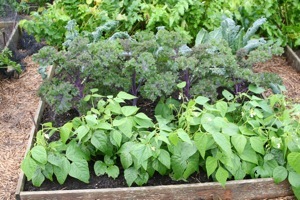 Now we are in the month of sowing winter salads for growing undercover. 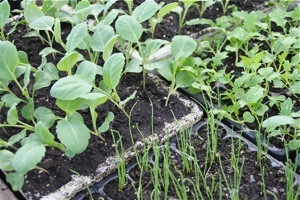 Slower growing plants like coriander, chervil, land cress and wild rocket want sowing asap if you have not sown them already. 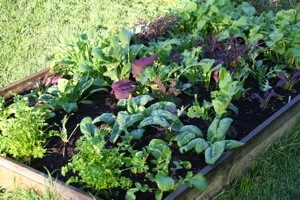 Spinach, lettuce, endive and chicory can be sown until about 10th, possibly until 15th, if sown later they risk succumbing to slugs while establishing. 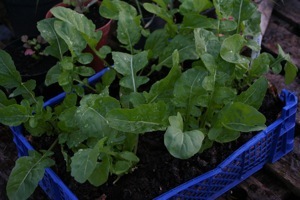 Oriental leaves and salad rocket establish well from sowing in mid month and until the equinox, which is last call. Undug in front, chervil in dug, behind and on right, is slug eaten, disappeared. Spacings as here, also red pak choi. No weeds. To pick not cut. 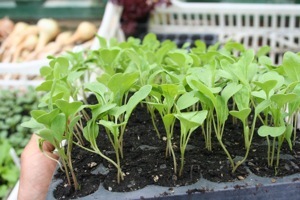 You can sow direct but if cucumber, tomato, basil and other summer vegetables are still growing in your protected space, sow in modules for transplanting in October. You can plant outside if then covering with a cloche or fleece, which should be sufficient to enable plants to survive the winter, even if they don’t thrive. 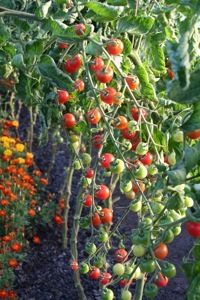 Main pickings are then in early spring. If you want salads on a windowsill or conservatory, set your plants (or sow seeds now) in boxes filled with compost and manure. 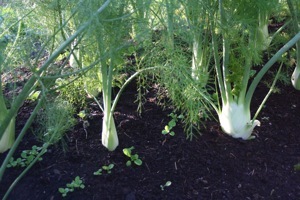 I intersowed fennel with lambs lettuce two weeks ago. 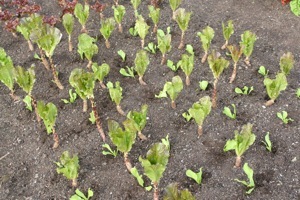 Interplanted lettuce (Rubens Red, rising to flower before it should!) with scarole endive two days ago. 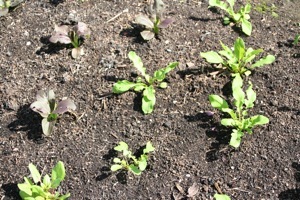 You can also sow lambs lettuce now outdoors, for growing without any protection, although a fleece cover in a really cold winter makes a difference, and is good for keeping rabbits off as well. 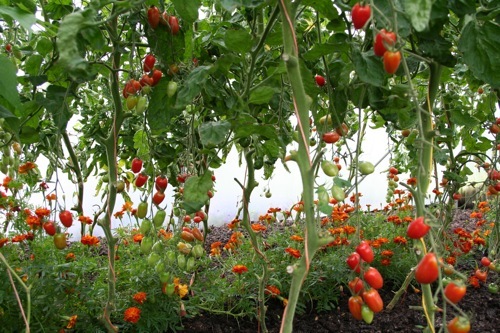 If you have managed to keep blight off tomato plants undercover, chiefly by keeping their leaves dry, this is a good time to reduce watering so as to encourage ripening of remaining fruit. 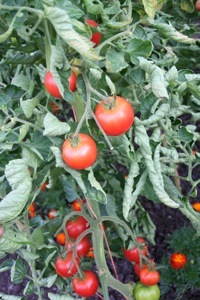 I water once a week in September, and even stop watering tomatoes at the equinox if it is damp and dull outside.